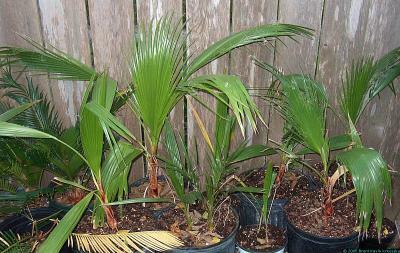 These are just regular, common, everyday palms. If you've ever seen any movie or tv show that has anything to do with Hollywood, you've seen these. In south Texas, you can go to any parking lot that has a Washingtonia somewhere in the vicinity, and sweep up seeds by the bucketful. The seeds are very hard so they don't even mind being driven over. They are edible if you boil them and wash them multiple times and then make a flour out of them, but you'll only want to do that if there ain't nuthin else to eat. On the other hand, bucketfuls of seeds, densely planted as a hedge, is a very nice look. The leaves have thorns that put a rose bush to shame.